I'm not sure which I hate thinking about more… lunch or dinner. Since I started working out of the home again for the first time in 5 years in January 2018 it has been rough. It also doesn't help we're living in an RV with a tiny fridge (this should be rectified soon). But, that's why I love that it's possible to have easy keto dinners to turn to when I'm feeling a little frazzled. Keeping things simple is something that I feel is important when you adopt a keto lifestyle. There are so many things out there that would make you think keto is difficult, but it's really not. Get your fat, get your protein, and limit your carb intake. That's about it. Looking for more easy keto meals? How can we keep things simple? Well, first, we can keep dinner simple. 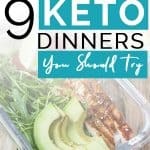 Initially, I was going to write up 7 easy keto dinner ideas, but I really like all 9 of these so it became a list of 9. Not to mention, you might get bored if there's only 7. Am I right? You'll find your favorite dishes on your journey and they may not be these particular ones. That's ok, but I wanted to help you with some that are fairly quick and easy to make. 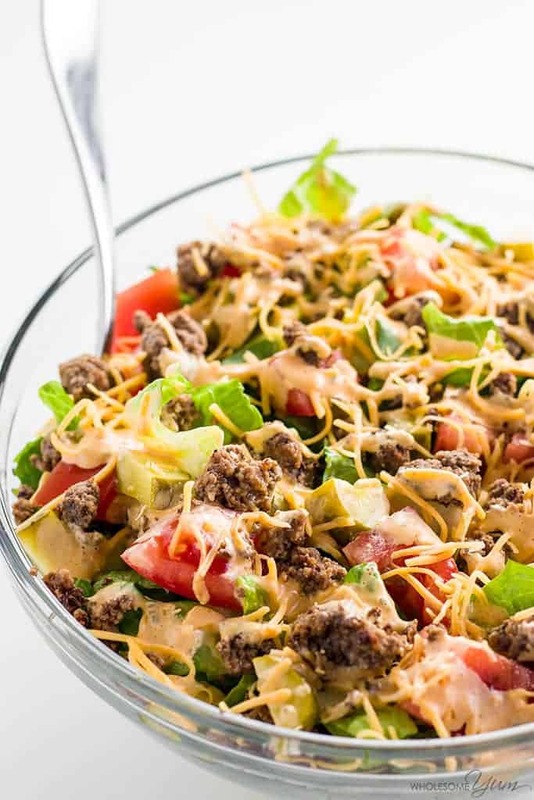 I'm a sucker for a good salad, and what's great about this one is that you can pre-cook the meat ahead of time during the week. Brown 1-2 pounds of ground beef with the seasonings listed for this recipe and keep it on hand to toss together quickly. It cuts down your cooking time and saves you time making it each time you want it. Meal prep at it's finest! Bacon wrapped anything is amazing! 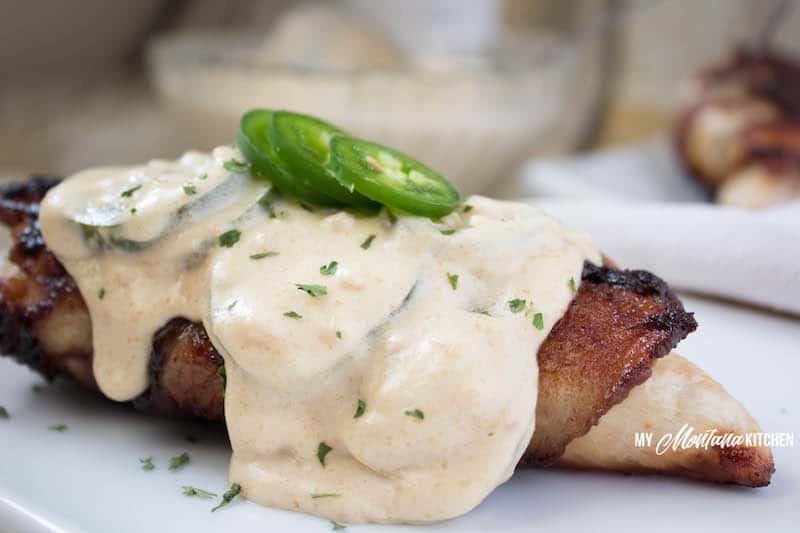 But, this bacon wrapped chicken with jalapeno cream sauce is some seriously delicious stuff. Adding the bacon to this with the cream sauce will help you meet your fat goal for the day. Toss extra chicken in a pan so you have enough for leftovers the next day. Nothing beats having your meals ready to go when you need to quickly head out the door. I'm a sucker when it comes to Mexican food. I'm even more of a sucker when it comes to Enchiladas (insert drool face). These make me so happy. All you need is the meat, some cabbage, sour cream, and enchilada sauce. These are great for make ahead meals. You can put quite a few in a 13X9 inch baking dish or even double the recipe. If you don't want to finish them right away then put the rest in Ziploc bags to freeze. If you've missed buffalo wings then these are going to be your new best friend! 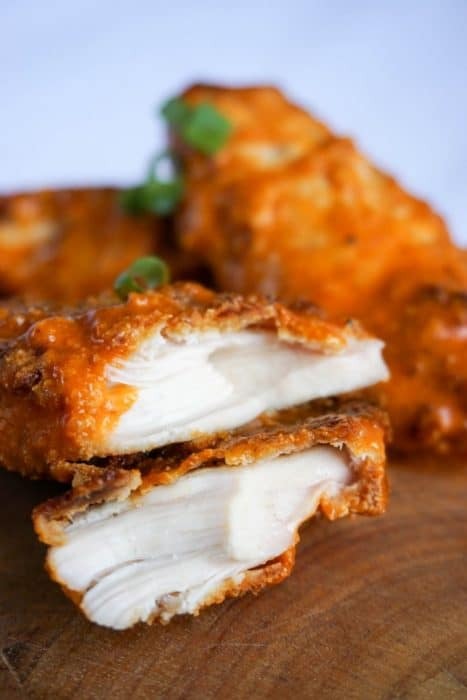 Even better, if you put them in an Air Fryer they will be more crispy than if you put the chicken in the oven. Then toss them in some buffalo sauce or your favorite sauce and chow down! Ok, maybe I just really love Mexican food. Can you blame a girl? These taco boats are super easy to make and something your whole family will love. 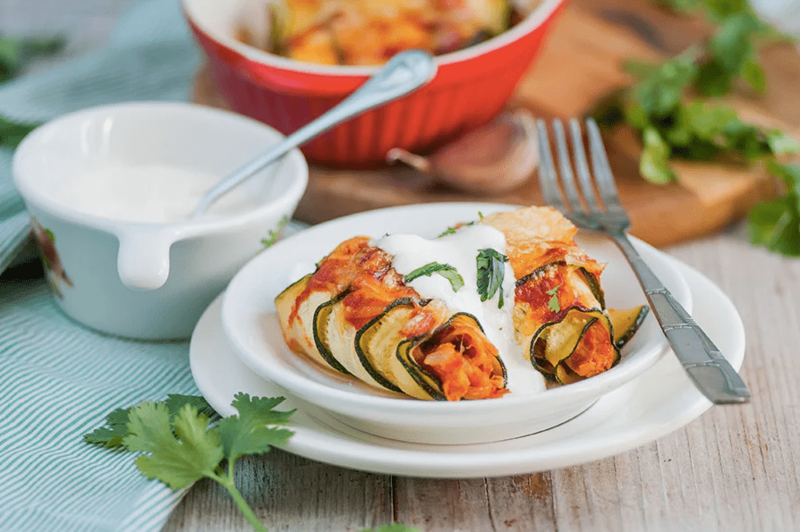 Even those that aren't eating a ketogenic diet will enjoy this dish. You won't even miss that they aren't made with corn or flour tortillas. Chicken, avocado, cheese, and some keto tortillas. That's all you really need. 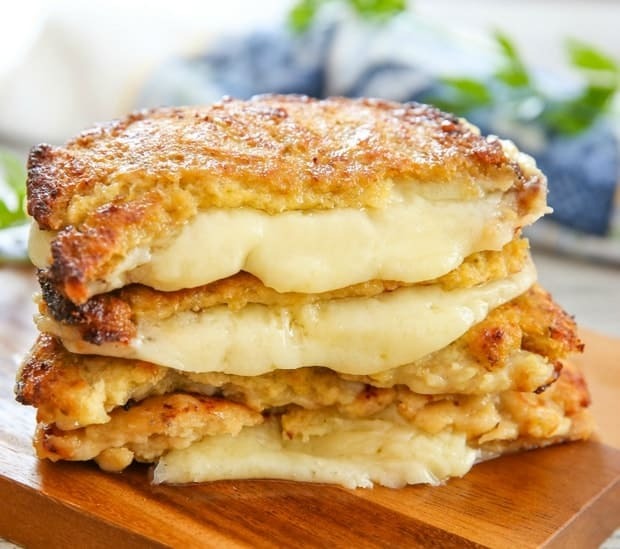 But, this recipe is super easy and seriously delicious. Don't pass this up. Add some sour cream, pico de gallo and maybe a melted cheese drizzle and you're set. 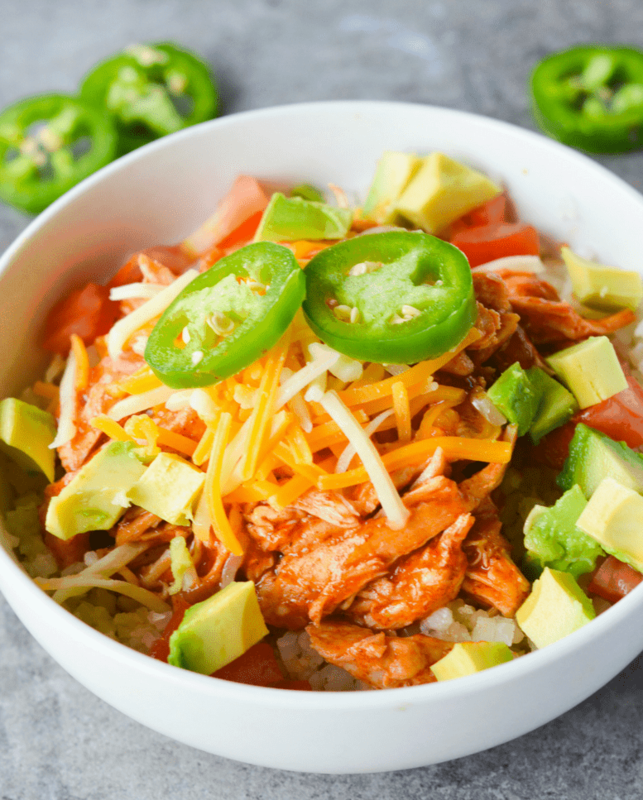 Between Hey Keto Mama's Enchilada Bowl and her White Chicken Chili bowl, you will be set for some great meals. I promise they're both amazing. I've made her Chicken Chili bowl quite a few times and my kids have loved it. Which surprised the heck out of me honestly. These both have a good amount of fat, so if you're struggling with hitting your fat goal for the day this bowl is an amazing thing to make. I've missed Grilled Cheese sandwiches. I won't lie. My kids will request them and I can get cranky. Memories of tomato soup and grilled cheese sandwich come back strong. These right here… they've made my life complete (maybe not that serious, but seriously). 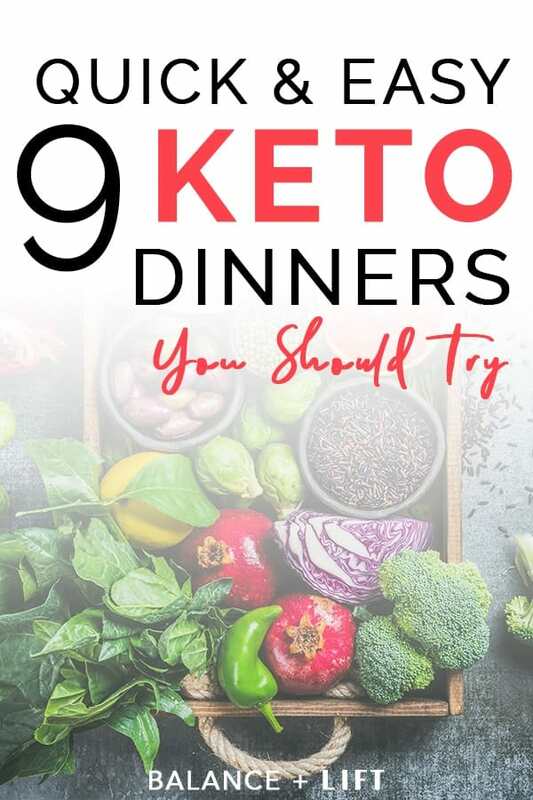 Give this easy keto dinner a try and see what you think about them. Watch the video of how to make this recipe here. Are you a fan of steak fajitas? 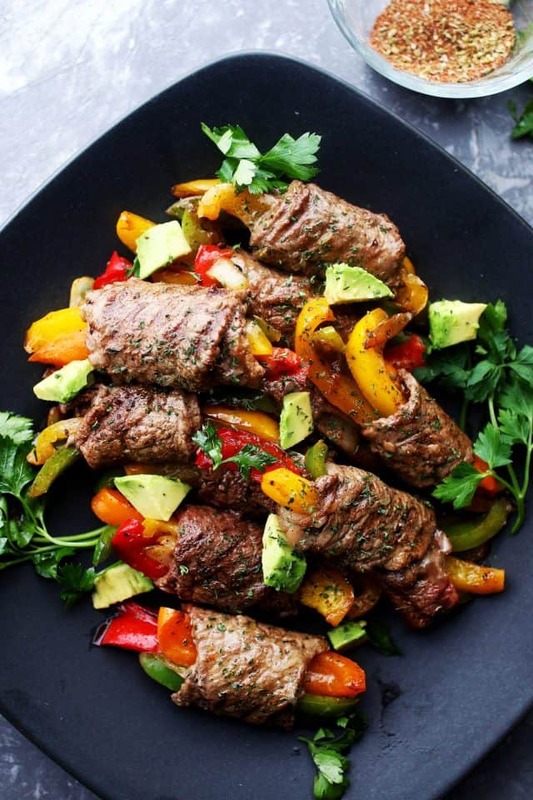 You need to check out these steak fajita roll-ups then! They're super delicious. You can use your favorite marinade (keto friendly of course) and toss these on the grill after work. They make for easy clean up once all is said and done. If you double this recipe you can have friends over for a good old fashion cook out. These meals are tasty, satisfying, quick and easy. It's important to find meals that you love when starting a new diet. These meals make it easier and more enjoyable.